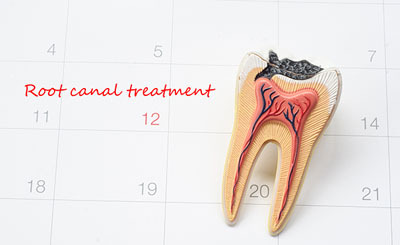 A root canal, also known as endodontic therapy, is used in to treat infected pulp. Pulp is a soft tissue residing inside teeth and is composed of nerves, blood vessels, and joining tissues. Many individuals are often afraid of receiving root canal treatment. Although the process is longer and more invasive than a check-up, it is far better than suffering the pain and discomfort of a diseased pulp. A root canal involves removing the infected parts of the tooth and protecting it from future contaminations. Continue reading to understand more about root canals and the conditions when it is required. What Prompts the Need for a Root Canal Treatment? Cracked, chipped, or fractured teeth are the most susceptible to infection. So, at the first sign of a damaged tooth, it is vital to repair it immediately. Unfortunately, if left untreated, food debris and bacteria can seep into the tooth, causing inner tissues like pulp to become decayed and infected. As the tooth deteriorates, you will experience pain. You may also notice symptoms such as severe sensitivity to varying temperatures, pain when chewing, swelling of the gums, tenderness around the area, and discoloration of the tooth. Should any of these signs arise, you are encouraged to seek immediate help. Letting the infection progress can lead to the loss of teeth. Related Article: Are Pain and Discomfort the Only Root Canal Symptoms? A root canal treatment takes about 1–2 appointments and requires at least 1.5 hours or more to complete, depending on the severity of the infection. The treatment involves removing the nerve and pulp. Before that is done, your dentist will apply local anesthesia to the area to limit any pain. A small tool is used to create an opening in the tooth so that it can be accessed. Once opened, the pulp is removed, and the canal is cleaned to eradicate the bacteria and germs that created the infection. Having a root canal is the ideal way to treat an infected pulp as it ensures that the infection is removed. It preserves the tooth, limits the occurrence of another infection, and protects the surrounding tissues from becoming diseased. Related Article: I had a Root Canal . Why do I need a Porcelain Crown? Due to the local anesthesia, a root canal treatment is not excessively painful. Those who have had the treatment say it is like receiving a filling. Despite the minimal discomfort experienced during the process, pain or swelling may be felt after the treatment. Your dentist may prescribe medication to manage pain in the days after the procedure. If pain lingers longer than outlined in the recovery plan set by your dentist, you should seek immediate care. Related Article: Why am I experiencing pain after root canal treatment? Adams Dental Group is dedicated to maintaining the oral health of our patients. We encourage people to practice good hygiene at home and to seek the care of a dental professional routinely. For this reason, we offer an array of restorative procedures, such as root canals when a tooth needs saving from decay or disease. Contact our office for more information on how we can help you!